When you put on a pair of rabbit ears and join a troupe of elegantly-dressed maids in a solemn prayer for the deliciousness of your beer, disability hardly seem to matter. In fact, it is often the so-called able-bodied among us who find themselves paralyzed by delight, apprehension, and fear. For they have no idea how to navigate the fantastic space of pink frilly catgirls, moe anime figures, and kawaii aesthetic. In the world of maid cafés, everyone is equally estranged from reality and made to grapple with the unknown. After all, how do you respond to a tsundere waitress delivering you a tabasco-laden cocktail while dancing to the rhythm of extremely saccharine J-pop? To find out and discover the meaning of disability in a space often associated with all things pleasurable and bizarre, I embarked on an epic quest: to survey as many maid cafés as possible in one afternoon. My first stop was to recruit some expert help from Dr. Patrick Galbraith, one of the world’s leading experts on Japanese café culture. A longtime friend and faithful companion, Dr. Galbraith became my guide and helped me navigate the twisted streets of Akihabara. Together, we rolled from café to café, looking for any venue that could accommodate my electric powerchair. At first, it seemed as if our efforts would be in vain, as we (literally) ran into stairs, narrow doorways, and other kinds of barriers at every turn. Many of Dr. Galbraith’s favorite cafés were off-limits: tucked away in shuttered basements or located on the upper floors of buildings without elevators. After around fifteen minutes of searching, however, Dr. Galbraith and I discovered our first accessible café. The entryway to @home café was like something out of a Disney movie. A big pink bow sat atop a white plaster gate, which led to a tunnel gilded with pictures of smiling maids in gaudy golden frames. At the end of a tunnel was an elevator, which was able to accommodate myself and my guest without much of an issue. We rode to the seventh floor before exiting into a narrow corridor, where we were greeted as ‘masters’ by one of the maids. After she saw my wheelchair, the maid asked if I would need a ramp to overcome the step up into their establishment, to which I replied “yes.” She quickly ran off toward the bar and grabbed a sturdy metal slope, putting it down so that my chair could make its way toward the stage at the back of the café. Unbeknownst to me and my guide, @home café had started to do live music and dancing shows, and we’d arrived just in time! Unfortunately, we couldn’t stay for more than one song (and drink) because we had many more cafés to explore! We paid our tab, collected our ‘MasterCards,’ and dashed toward our next stop. The second accessible café we visited was Maiddreamin’. While the atmosphere of @home café could be described as a loud and raucous bar, Maiddreamin’ was far more intimate. There were only a few tables at the establishment and the maids themselves were turned up to eleven. Far more than simple servers or dancers, the maids were fully immersed in their craft: every step they took, every tune they hummed under their breath, gave the impression that this was a space of ‘cuteness,’ moe, and kawaii. Their patrons, an even split of men, women, boys, and girls, were entranced by the whimsical environment they created. To access that environment, Dr. Galbraith and I took a magical portal: a fairly wide elevator located at street level. Shortly after arriving, we were joined by my caregiver, who was disorientated by the whole experience: he had no idea how to act when one of the maids asked him to make a heart with his hands and fire a cuteness beam at his food. The third café on our journey, Cure Maid Café, was completely different from the first two. Gone was the boisterous bar and choreographed cuteness, replaced by a quiet, library-like atmosphere. Here was a place that I could sit and read a book, enjoy a coffee, and feel like an aristocrat out of some French film: I needn’t bother with the trappings of call-and-response. The maids who served me were also in far more conservative attire, and their mannerism reflected their dress. Sipping on my third beer of the day, I ordered a plate of German sausages, which came out grilled to perfection. As I ate my lunch, I struck up a conversation with Dr. Galbraith about the history of the café, learning that it was among the first to open in Akihabara and the oldest of its kind. Intrigued, I looked at the ornate wooden lattice around me and thought to myself: how interesting, that the oldest café in the city was the easiest to navigate in my wheelchair, bathroom and all. Why might that be? I didn’t spend too much time dwelling on the question, as there was one café left to explore. The final stop on my ‘café crawl’ was New Type, a local neighborhood bar with a twist. Like @home café, maiddreamin’, and Cure Maid Café, the servers at New Type all wore long-dresses and fashioned themselves as maids. They prepared delicious food, sat down for stimulating conversation, and drank glass after glass of beer alongside Dr. Galbraith and me. But there was something that set apart New Type from its competition: all of the servers were biologically male. As a scholar of disability and gender I couldn’t resist the urge to ask about how they conceptualized their craft. Before long, the entire room was buzzing with talk about constructions of masculinity, femininity, and maid culture. Imagine, a couple of foreigners, sitting in a dimly-lit room with five gender-queer maids, waxing philosophic and jamming out to songs from Neon Genesis Evangelion. 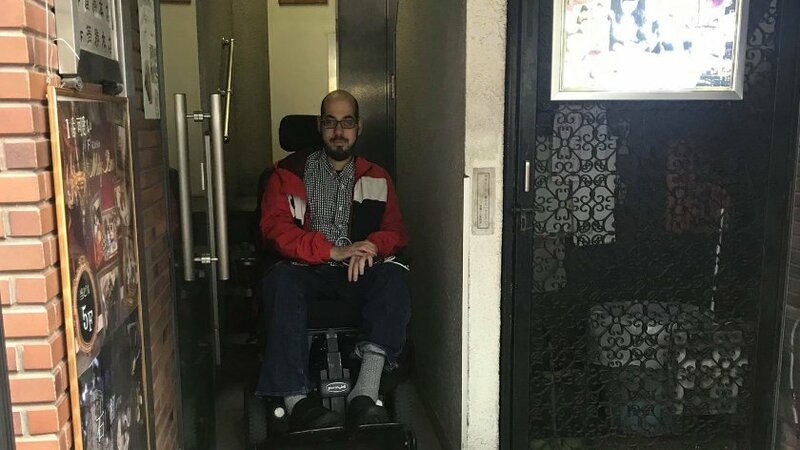 In that environment, my using a wheelchair hardly seemed to matter: it became a talking point, like any other part of my identity, and it enriched, rather than impeded, our collective celebrations. 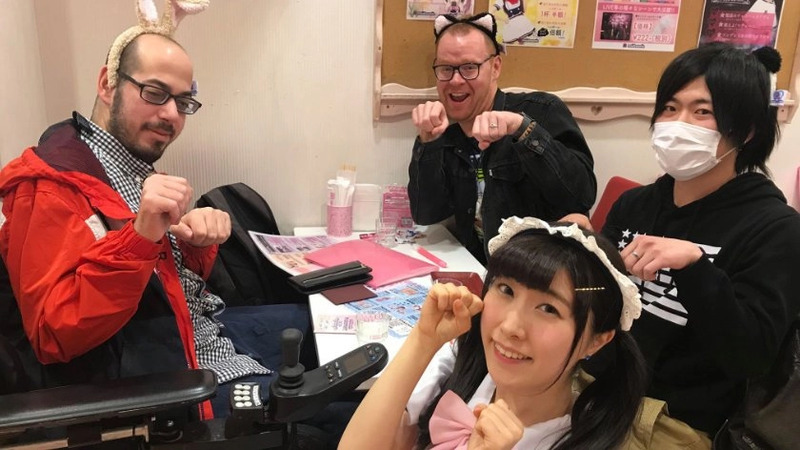 So, what can I say to wrap up this guide to accessible maid cafés in Akihabara? Well, for one thing, there are far more options than I initially expected in terms of both size and scope. While some cafés remain hidden away in remote corners of compact buildings, others are easily accessible from the street via ramps and elevators. I was surprised to find that many of the cafés I visited were well-equipped to accommodate my foreign powerchair and navigating their interiors was not much of a challenge. Indeed, I was able to thoroughly enjoy myself at each café, so long as I was able to get in the front door. Now, I recognize that this review has focused on physical accessibility as opposed to other kinds of access: sensory, environmental, and so forth. I’d like to think, however, that my description of the differing atmospheres at each establishment has leant itself to the idea that there is a café out there for everyone. No matter what kind of body or mind you may have, there’s a café for you provided you’re willing to immerse yourself in its mystique. Having said that, I encourage you to go out and explore! 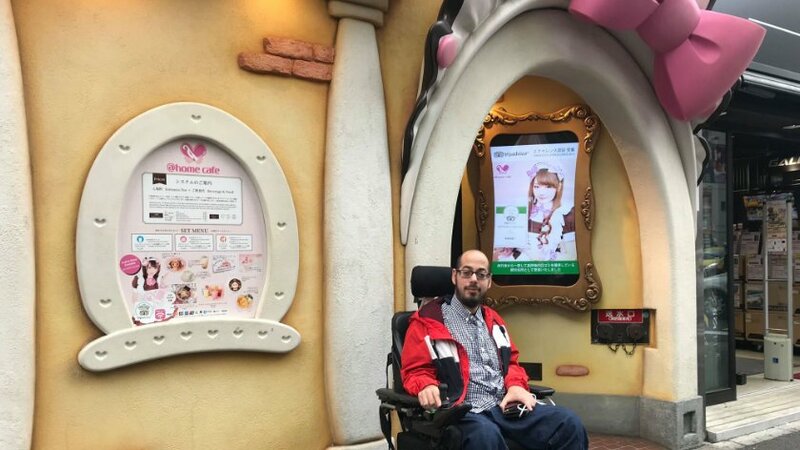 You never know what you might find, but whatever your experience, please report back to us at Accessible Japan! Working together, we’ll ensure that everyone can easily access and enjoy all that Japan has to offer. Mark Bookman received his B.A. in Global Interdisciplinary Studies from Villanova University in 2014 prior to researching Buddhist Philosophy in Japan as a Fulbright Fellow. He earned his M.A. 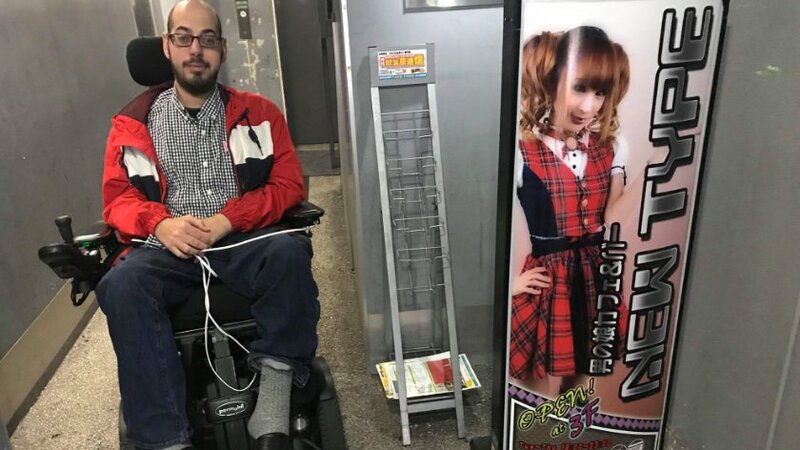 in East Asian Languages and Civilizations from the University of Pennsylvania in 2016, where he currently studies the history of disability in Japan as a PhD Candidate. At present, Mark is working with experts on disability and barrier-removal at the University of Tokyo’s Research Center for Advanced Science and technology as a Japan Foundation Research Fellow. Even though Mark keeps himself busy (VERY busy!) he has agreed to take on a role at Accessible Japan as a researcher and consultant.